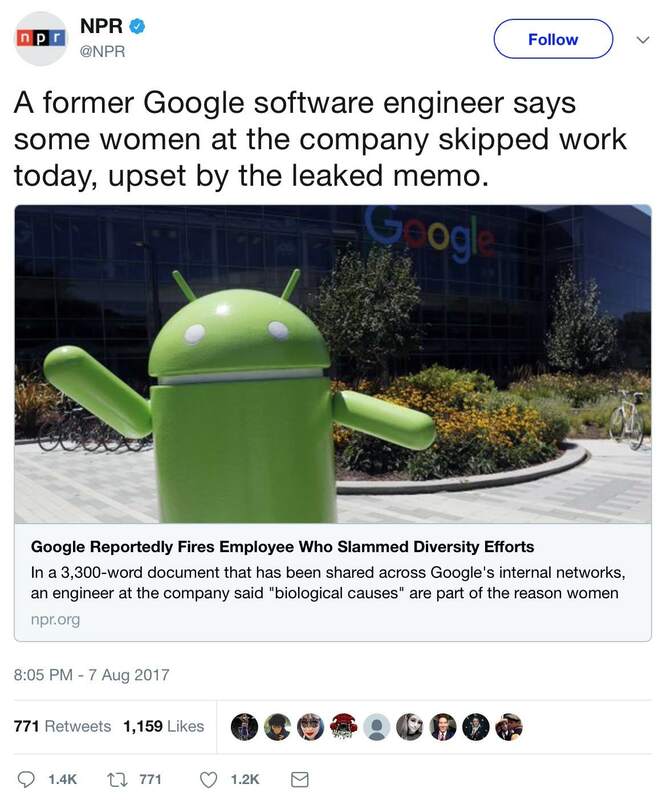 Monday evening, National Public Radio published a tweet about the Google-free speech controversy that raised eyebrows and brought on torrents of ridicule, namely that "some women at the company skipped work today, upset by the leaked memo" written by now-fired software engineer James Damore. It turns out that the basis for the claim is so extraordinarily thin that it shouldn't have been reported. On Twitter, the ridicule directed at female employees who allegedly stayed home in the tweet's 1,400 comments was fierce, especially in noting how the reported reactions essentially confirmed one of the premises in Damore's "Echo Chamber" document, namely that "Women, on average, have more Neuroticism (higher anxiety, lower stress tolerance)" (link is in Damore's original). But did what NPR reported really happen? The network's underlying article containing the claim by Bill Chappell and Laura Sydell reported this "news" in its third paragraph. ... Ellis said she left Google in 2014 after she was sexually harassed. When she read the leaked document, it didn't surprise her "because I saw similar language when I was at Google being shared on internal message boards and other different internal forums." ... In April, a Department of Labor official accused Google of practicing "systemic" discrimination against female employees. There is no evidence that NPR spoke or communicated with any female Google employee who stayed home, or with any Google supervisor or manager who could have confirmed that any female employees stayed home. In March 2015, she issued a series of tweets, several of them naming names, about her treatment while she worked for Google, including specific instances of alleged sexual harassment. However, according to Business Insider, Ellis also tweeted that "I have no proof of any of this." In February of this year, in connection with Uber's firing of former Google executive Amit Singhal, who had resigned in 2016 because of "credible" allegations of sexual harassment during his time at the search giant, Ellis "shared some of her own experiences with at the company in light of the news surrounding Singhal’s departure." Among other things, she claimed that male executives at the two companies "just get shuffled around, with zero regard for the women in our industry," and that "At the highest levels of leadership at most SV/SF (Silicon Valley/San Francisco) tech companies, execs are hiring their buddies outside of the usual hiring process." On Saturday, she weighed in on Damore's document, claiming that "There are many people at Google who share this guy's views." Three years later, does she really know this? Ellis may very well be telling the truth, but NPR's failure to interview, even anonymously, any actual women employees who skipped work on Monday means that the network should have considered her contention a rumor. There appears to be another motivation to report this rumor. The point is that reporting what many have described as the "snowflake" reaction to Damore's document appears to anecdotally support the notion that Google has a workplace environment which is hostile to women. The NPR reporters surely know this. But regardless of how it does or doesn't advance particular agendas, is NPR's sole reliance on someone who left the company in 2014 justified? Longtime blogger Ann Althouse, who leans left, says "No." Did Google women stay home from work because they were upset over the Damore memo? ... I wonder how Kelly Ellis knows what women in her former workplace did and why they did it. ... Why did NPR speak with Kelly Ellis and why did NPR not talk to any of the women whose actions and emotions it is portraying? If I had to guess, I'd say it's because Ellis said something that NPR believed fit very nicely into the story it wanted to tell, and it either didn't bother to check more deeply or it tried and couldn't find these women but still thought the idea was too good not to use. Again, NPR is in a cocoon if it didn't see how this fact/"fact" would be used by those who want to say there's no real problem of gender discrimination in the tech industry. ... I'm going to answer my question in the post title: No. It's a myth, an urban legend. ... You need to be skeptical about things that fit your template. Those who are accepting this report at face value and using it to support the idea that women really are emotional and ill-suited to a high-pressure workplace are engaging in the same kind of cocoonish behavior that we're seeing from NPR. My take is that Kelly Ellis may be telling the truth, but her claim is unproven. As such, regardless of who it helps or hurts, NPR should not have reported it.